The Men’s Group Annual Burns’ Supper will be held on Wednesday 21 January in Cumbernauld Bowling Club and everyone is invited to come along to this extremely popular social event in the Church calendar. Cumbernauld Burns Club will provide their usual, entertaining dialogue, masterminded by Callum Cormack, our Chairman for the evening. Our own Janet Graham and David Boyle will provide excellent musical interludes and Anne Walker will provide her usual wit in defence of the ladies. You will also be served a first class meal! All in all, a great night, not to be missed. Tickets are now available from any member of the Men’s Group, modestly priced at £7 per head. The time on the evening is 7.00pm for 7.30pm. Hope to see you there. Our annual Rainbow Service was on the afternoon of Sunday 14th December. During the service we invited those attending to tie a coloured ribbon to a branch of a tree in memory of someone who had died and whom they wished to remember. What had started out as bare branches soon became a riot of colour as more and more ribbons were added, each one remembering someone special. 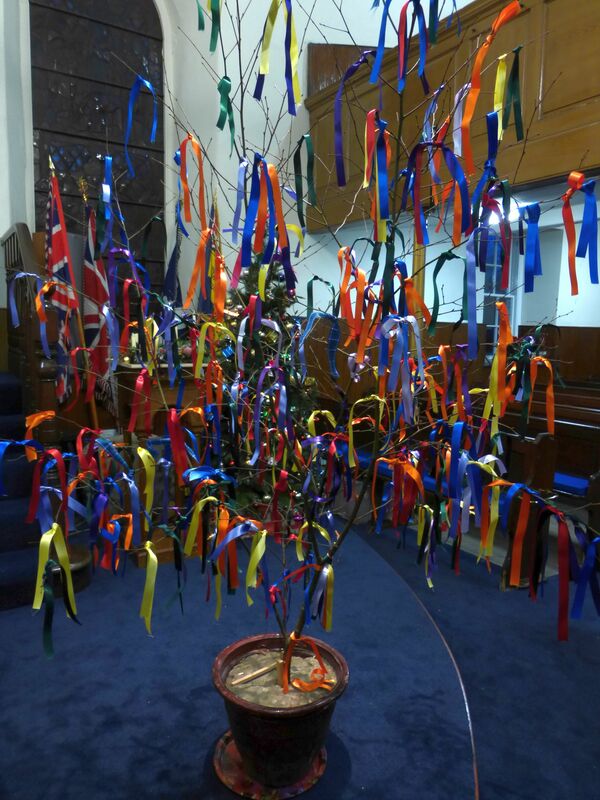 The Rainbow Tree will remain in church, with another at the Forge Centre in Balloch, through the winter months and you are welcome to add ribbons to it any Sunday before or after our worship services. On Easter Day 2015 the ribbons will be removed, ironed and used to make something beautiful for the sanctuary or for other people who have been bereaved. On Wednesday 24th December there will be a Christmas Eve Service in the Forge Centre, Balloch at 7.30pm and a Watchnight Service in the Parish Church, Cumbernauld Village at 11.30pm. On Thursday 25th December we invite you to our Christmas Day service in the Parish Church at 10.30am. On Sunday 28th December, morning worship will take place at 10.15am in the Parish Church at at 11.45am in the Forge Community Centre, Balloch as usual. Our annual service of memorial and remembrance is this Sunday 14th December at 3.00pm in the Parish Church, Cumbernauld Village. This service is especially for people who have been bereaved – recently or long ago – and who find the ‘jolly’ side of Christmas painful and wish to remember loved ones quietly. The service will last about 45 minutes and there will be tea and coffee afterwards. Please note that the service is not suitable for very young children (under three) but there will be a crèche and helpers available to look after the children during the service. The Rainbow Tree will remain in church after the service, with another at the Forge in Balloch, and you are welcome to add ribbons to it any Sunday during the winter months.